I’m an avid reader of sports literature. I concentrate mostly on baseball and hockey, with a little football thrown in. I review each book I read, and I’ll post my reviews here. Reading the fourth and last book in Mark Harris’s Henry Wiggen series, I was very sad to bid Wiggen goodbye and to see the story of his world come to an end. A season veteran of thirty-nine years, Wiggen has been released by the only ball club he’s ever played for. He still feels able to pitch in short relief, so he’s determined to sign on with somebody somewhere. Mixed with the trials and tribulations of coming to terms with the uncertainty of life after baseball and in retirement are Wiggen’s grappling with a midlife crisis and a difficult youngest of four daughters prone to fits of screaming. The Henry Wiggen series has truly set itself apart in the world of baseball fiction because it lacks the usual sentimentality usually associated with good baseball stories. Harris stays true to Wiggen’s character, cultivating his mannerisms and speech and showing plainly his disregard for good spelling and grammar in favor of getting to the point. This book is an absolute must for fans of the series, and the series is an absolute must for fans of any sport. In the third book of Mark Harris’s Henry “Author” Wiggen series, we see Henry Wiggen as a man who’s learned from his life experiences. He receives a letter from a seamstress living “somewhere out West” who’s given up everything to travel across the country and watch him pitch. Already married with children, Wiggen attempts to redirect the seamstress’s affections toward his roommate, the rogue daredevil catcher Piney Woods. Piney Woods is a bit naive on the ballfield and in life, but the seamstress gives him a reality check, and Wiggen helps him make the most of it. Harris has done it again in this short but sweet novel, revealing how much his narrator has matured and how skillful he’s able to write, even if he doesn’t know how to spell every word. I recommend this book to fans of the fantastic Henry Wiggen series. In the second book of his four-part series narrated by fictitious southpaw Henry Wiggen, Mark Harris continues to reveal the human side of baseball minus the cliches. In this second installment, Wiggen, now known as “Author,” is a father, a seller of insurance, and an established ace in the New York Mammoths’ rotation. He then also becomes the sole companion of Bruce Pearson, the third-string Mammoths catcher, when he learns that Pearson is dying of Hodgkin’s disease. Unable to bear the secret alone, Wiggen tells certain members of the team, but word eventually spreads, and it is this tragedy that ultimately brings the team together for a World Series win. Harris maintains Wiggen’s colloquialisms and unique manner of speech, and he allows the reader to witness Pearson’s suffering with Wiggen. This book is a must-read for baseball fans, especially those who enjoyed “The Southpaw” and who’ve seen the movie. within the organization to encountering racism towards his African-American teammate to becoming a man that his father, his girl, and he can be proud of, Henry experiences all of the usual growing pains on the mound of a baseball field. In the end, he becomes a left-handed hero who gets his girl and writes a book about his journey. Henry Wiggen is the salt of the earth; though not book-smart, he’s savvy, charming, and knowledgeable. Once you enter his world, it’s difficult to leave, and you finish the book happily aware of the fact that there are three more to come. As a diehard Bruins fan, I couldn’t resist this classic. George Plimpton, one of the world’s best participatory journalists and sports writers, is at it again as he realizes every fan’s nightmare by getting in goal for the Bruins in the late 1970s. From training camp in Fitchburg, Massachusetts to a five-minute exhibition game in Philadelphia against the Flyers, Plimpton encounters it all, from his rookie initiation to reminiscing about Bobby Orr to discovering the origins of a questionable odor that permeated his pads. He never missed a beat, and his writing is entertaining, funny, and insightful. The personalities that he befriends are truly unique, and his account affords an exceptionally up-close-and-personal look at what transpires on and off the ice in generations past and present. He examines every aspect of the sport itself and the life of a hockey player. I strongly recommend this book for hockey fans, especially those with a sense of humor. Just when you think you know the story inside and out, Wayne Coffey surprises you. 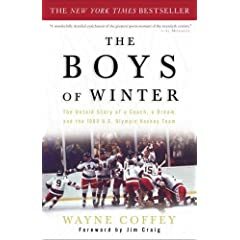 This story never gets old, and Coffey’s uniquely structured narrative weaves brief endearing biographies of the players with play-by-play action of the USA-Soviet game on February 22, 1980 in Lake Placid, the world’s last small-scale Olympics. The story retold in this book catches your heart all over again, and Coffey’s dynamic, entertaining, knowledgeable, and endearing style of writing grip the reader from start to finish. He captures the soul of the team and eloquently verbalizes the team’s path to success and the reasons behind it. I strongly recommend this timeless account of the ultimate national sporting triumph to, not only hockey fans, but readers of all interests. Ring Lardner’s fictional collection of letters from “busher” JackKeefe has been praised and heralded since its first publication in 1915. The book has since been declared the finest baseball fiction ever and faced no competition for that title until Mark Harris published his first Henry Wiggen novel in the 1950s. 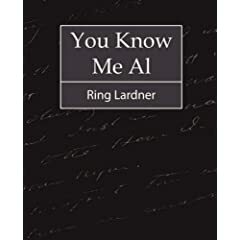 Lardner’s novel is actually a collection of letters from Jack, the narrator and protagonist, to his best friend and “old pal” Al in his hometown of Bedford. Jack Keefe’s character is very amusing because he is talented but arrogant and naive and never takes responsibility for anything. Closed- and simple-minded, Jack pitches for the White Sox and manages, or attempts to manage, relationships with women. I was very excited to read this masterpiece of sports literature, but upon reading it I found that, although slightly amusing, the book was quite slow and dated, and it failed to really grip my interest and attention. However, Lardner does have his moments; his story is charming and his angle of storytelling is unique. Funny, entertaining, heartwarming, eloquent, and descriptive in all the right places, John Grisham’s new novel is as fun for us to read as it was for him to write. Rick Dockery, a third-string quarterback playing for a different NFL team every year, single-handedly loses the AFC title game for the Super Bowl-starved Cleveland Browns. After the Browns release him, his agent miraculously finds a team very anxious to have Rick not only play but start as quarterback. The team is the Parma Panthers. Running out of options, Rick finds himself in Italy and begins exploring the country’s food, wine, opera, culture, and football. Grisham uses all of his talents here, and I strongly recommend this book for readers across the board. “Playing for Pizza” is a great read. When I first started reading Jay Atkinson’s book, it turned out to be something completely different than what I thought it would be. Soon, I realized that the difference was for the better. This book is a cross between a memoir and a documentary. Jay Atkinson, an avid hockey player and fan and local rink rat of Methuen, Massachusetts, has the opportunity to relive high school as a hockey player when he becomes a coach’s assistant at Methuen High School. Many of Atkinson’s former teachers are still there, and Atkinson soon endears himself to the 1999-2000 varsity ice hockey team, to which his 5-year-old son aspires. The book is nostalgic and heartwarming, and it also provides a clear and vivid picture of life in rural small-town America. By the end of the book, one feels as if one knows Methuen’s hockey players intimately, as old friends. Atkinson allows the reader to see what he saw during that hockey season: young men maturing, a small boy finding passion for the game, and a middle-aged man finding youth again. A must-read for high school hockey players and their fathers, high school hockey coaches, and the avid hockey fan with a true passion for the game. George Plimpton is a master of participatory journalism, and this is the account of his first foray into that field. The book is short but pleasant to read. It is comical, friendly, and realistic. In “Out of My League,” Plimpton comes away from a baseball game wondering what it would be like to actually pitch against Major League batters. With the help of Sports Illustrated, he is given the opportunity to pitch to the American League and National League starters before an All-Star exhibition game in late October. With all his skill and charm, George Plimpton describes from experience what would surely happen if any average fan suddenly walked onto a baseball field and was given the chance to pitch. For Plimpton fans and baseball fans, this brief but entertaining account is a must-read. Fine literature on the subject of hockey is unfortunately difficult to find in the United States. This anthology is a must for hockey fans everywhere but especially in the United States because some of the selections are excerpts from books that are truly remarkable and entertaining. Bryant Urstadt does a great job of bringing the reader a truly multifaceted taste of the game. From how to build your own hockey rink to how Americans reacted after the Miracle on Ice, from legend William Faulkner to the truly distinct Red Fisher, this anthology offers an endearing, entertaining, enriching, and awakening view of what has evolved into a game of, not just a nation, but a world. The fact that I am an avid Red Sox fan has nothing to do with the fantastic literary quality of this memoir. Red Sox fans everywhere simply must drop what they’re doing at this moment and read this book right now. Over the years, I’ve been asked to explain why Red Sox fans do what they do, say what they say, and act how they act. “Read Sullivan’s memoir” is the closest I’ve as yet been able to come in explaining the heart of Red Sox Nation. The title speaks for itself as Sullivan relates his own experiences as a Boston fan behind enemy lines to those of Red Sox Nation, New England, fathers, sons, and friends at large. This book inevitably draws emotions of both utter despair but ultimately of supreme happiness and triumph; indeed, Red Sox enthusiasts will inevitably shed tears of joy at the fond memories of the salvation of the 2004 World Series. Sullivan instills hope in Red Sox Nation while penning the unique trials and tribulations that have faced and will face each generation of Red Sox fans. The writing is casual and friendly; it is as though Sullivan is using this book to pass down the tradition of Boston faith to generation after generation. I definitely recommend this book to all, regardless of literary interest. “For Love Of The Game” was Michael Shaara’s last book before he died. This novel is one hundred and fifty pages of pure quality baseball fiction. The plot spans the last game of Billy Chapel, a legendary pitcher headed for retirement and for the Hall of Fame. Chapel is unwilling to grow up and has seen the game change. He has aged, the owner of his team that had signed him and had recognized his value to the team has left, and he has decided to go out with a bang but without growing up. Chapel struggles to admit his love for a woman and to finally retire from the game of baseball. Shaara reveals to us his innermost thoughts between innings and his interactions with his teammates. This book is a masterful specimen of sports literature, and it’s simply exquisite. The book is beautifully and skillfully written, the text so close to the game that one can almost smell the freshly cut grass and hear the pop of the ball in the catcher’s glove. An avid baseball fan, I had a lump in my throat at the end of Chapel’s heartwrenching journey in his quest for a perfect game and, ultimately, for finally growing up. world while preserving that small spot of perpetual sunshine called Summerland. As a diehard Bruins fan and therefore someone who despises the Habs, I had a difficult choice to make. I could refrain from reading a literary hockey classic because it was written by a Canadien, or I could, in the interest of a love of sports literature and a general love of hockey itself, temporarily put aside my dislike to read this book. I decided on the latter as my course of action, and I’m very glad I did. This is, without a doubt, the greatest hockey book ever written. Former Montreal Canadiens goaltender and Bruins heartbreaker and current legend Ken Dryden uses this memoir to provide the reader with a window into the old time world of 1970s hockey, the golden age of the Montreal Canadiens, and the history of the game’s culture and the game itself. Dryden vividly tells his story in the present tense while weaving hockey’s history into accounts of his experiences. “The Game” is definitely a must-read for hockey fans and sports literature enthusiasts. If you’re a Bruins fan, you should not shy away from this book. I know from experience that, at times, it’s difficult to read, but it’s worth it in the end. Bernard Malamud was a Jewish author writing in the postwar period, when many artists were disillusioned with the events that had occurred in Europe. “The Natural” starts out with the story of Roy Hobbs, a young pitcher with remarkable natural talent and ability. However, by the end of the book, after having finally entered the major leagues as an outfielder, accompanied by his handmade bat Wonderboy, Hobbs is forced to retire from the game in disgrace with the possibility of having his stats stricken from the record books. How Roy Hobbs went from a legend in the making to a sellout has largely to do with two women who utterly ruined his life and one woman who tried, too late, to save it. “The Natural” may not have a happy ending, but it is a classic of sports literature and also of literature at large. I was, however, surprised at how little I ended up enjoying this book, although I am very glad that I read it. I first read “Moneyball,” and “The Blind Side” is just as phenomenal. Michael Oher is one of many children of a cocaine-addicted single mother in Memphis’s seamier side. Given by chance the opportunity to study at a prestigious Christian secondary school in Memphis’s more afffluent area, Oher begins a new life when he is adopted by the evangelical Tuohy family. Lewis relates the history of football as it pertains to the position of Left Tackle, the rise in importance of which allowed Oher to be scouted by universities with the top football programs in the country. Once a neglected boy whose destiny was to become a member of a gang of drug dealers in Memphis, Michael Oher currently attends Ole Miss and will most likely be drafted by the NFL after graduating. I am not a football fan and know relatively little about the game, but I thoroughly enjoyed Lewis’s book. It is heartwrenching, inspiring, and entertaining. To say that Michael Lewis’s “Moneyball” fits only the category of sports literature would be misleading. The book is a tale of baseball, definitely, but also of economics and psychology. Lewis takes the reader into the front office of the Oakland A’s where General Manager Billy Beane uses funds that are insufficient at best to somehow pull together a baseball team that somehow frequently ends up near or in the playoffs. Economic wheeling and dealing as applied to the business of baseball takes center stage here, combining with the psychology of old school versus new school corporate managing and scouting. Baseball yuppies face off against one-time pros, Chad Bradford masters his delivery, and Scott Hatteburg redeems himself at first base. This book is ridiculously entertaining and suspenseful. For the avid baseball fan, this book is an absolute must. For those interested in economics and in psychology, this book is also a must. “Moneyball” is one of the most unique and one of the greatest specimens of baseball nonfiction. Good RS book just out by former RS pitcher and recent Boston HOF inductee Frank Sullivan! Just wanted to post and let you know your site is pretty cool. Hey, great post! This is exactly what I was searching for. I liked this blog post, it helped a lot! Thanks! So much info. This is the most amazing site, dude. I’d love to recommend Fenway Fever by John H. Ritter. It’s an ideal novel for Sox and baseball fans, young and old alike.